All persons are encouraged to consider their individual ability, comfort and safety when choosing to run outdoors with possible ice or snow conditions. Please note, safety will be the primary focus of weather related decisions. FRTR will consider present conditions as well as probable conditions at the time of the club group run or event. 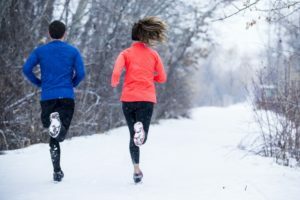 You may use the below as a general guideline for meeting location of Saturday and Sunday group running in the winter – typically November to March. If the trail is dry and snow is in process or snow is due to start during run. If there is less than 2 inches of fresh snow and has not gone thru a thaw/freeze cycle. Winds in excess of 25 mph may result in cancel of run however, runners should use their own judgement if they decide to run that day. Snow over 2 inches expected to be already on the ground by the weekend. If rain combined with freezing temps or rain on top of prior snow causing slippery conditions. Prior snow has gone thru thaw/freeze and still on ground. All location updates will be posted to the FRTR Facebook pages and display on the front page of FRTR.org, in the Facebook scroll to the right of written announcements. If you are engaged in the Spring Endurance Training program you will receive email updates from FRTR training or coaches. These emails may include updates to meeting time and advisements on cautions for expected weather conditions. If you have any questions on this policy please contact the FRTR club president.